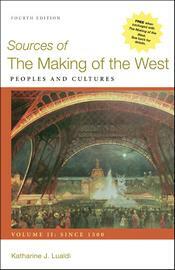 Sources of The Making of the West provides written and visual documents closely aligned with each chapter of The Making of the West. This two-volume collection reinforces the major political, economic, social, and cultural developments in the textbook by allowing students to engage directly with the voices of those who experienced them. Over thirty new documents and visual sources highlight the diversity of historical voices — including both notable figures and ordinary individuals — that shaped each period. To aid students in approaching and interpreting documents, each chapter contains an introduction, document headnotes, and questions for discussion.